The L4 Field Jacket was designed for pure functionality. 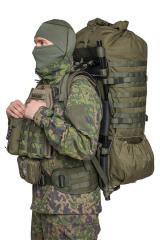 Smart materials and a purpose built design guarantee the best possible comfort regardless of what type of fighting and/or sustainment load you´re carrying. 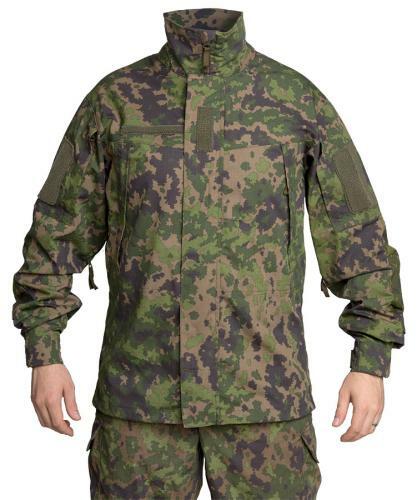 This is a great alternative for the Finnish military issue M05 jacket, which suffer from a load of compromises due to the fact that it was designed to double up as parade wear. Relaxed fit to accommodate warm mid layers. Full length two-way front zipper w/ interior storm flap. Button and hook-and-loop exterior storm flap. Elastic draw cord adjustable hem. Reinforced elbows with elbow pad pockets (we recommend CPE insert pads). 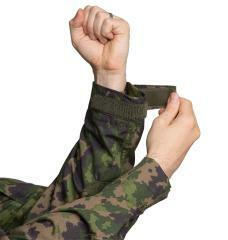 Hook-and-loop for name, rank and sleeve patches. Two zippered upper arm pockets. 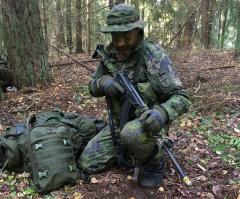 M05 woodland camo: 50/50 CO/PA. Reinforcements 500D Foxdura. 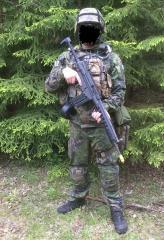 M05 winter camo: 70/30 PES/CO, including reinforcements. All materials are NIR compliant. Does the zipper feel difficult to close at first? This is due to the locks not being in their absolute bottom position. Make sure you´re not pressing the lower lock upwards with a finger, the easiest trick is to put a little downwards pressure on the top lock and it will push the bottom one into correct place too. We have not sacrificed simple reliability for functionality, the L4 Field Jacket is wear resistant, easily cared for and when need be also easily repaired. The materials are simple but functional. all buttons are Canadian style slotted buttons and wear prone details such as hook-and-loop fasteners are designed to be easily replaced if needed. The L4 Field Uniform stands for simple functionality, the stuff that you learn to value when you´re "out there" for extended periods. 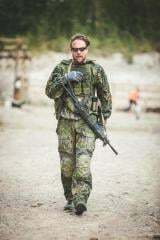 When it comes to comfort the most important detail apart from the quick drying fabric is the minimalistic torso: no buttons, no zippers, no press studs and no cord locks that could cause discomfort when pressed against by armour and load bearing gear. 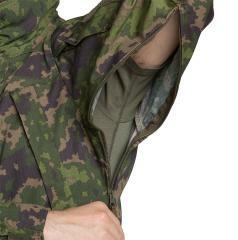 The armpit vents ease thermal load resulting in less sweating and less sweating means less freezing in cold weather. The protective collar and longer back hem offer added protection from the elements. These details extend the L4 Field Jacket´s use far beyond the warm summer months. The L4 Field Jacket has no pockets which could under any circumstances be more useless than useful. There are no hem pockets: in a hem of this length they would just be squeezed beneath body armour or rucksack hip belts. 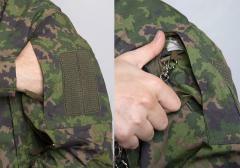 The chest pockets are flat and open up from the outer sides, this means they are somewhat accessible when wearing body armour and the zippers won't cause discomfort under hard armour plates. Both sleeves feature zippered upper arm pockets, these are always accessible no matter what kind of fighting/sustainment load you´re using. Other neat details include the reinforced elbows with pad pockets. The upper arm pockets have small "idiot cord" tie down points inside for securing valuable trinkets. The hook-and-loop cuffs offer enough adjustment range to sit tight around any wrist. There are seams or stitches on top of the shoulders, a small but nice details that further adds to the overall wearer comfort. 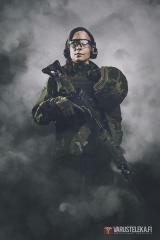 The fourth layer of our clothing system could be regarded as "standard camouflage dress". 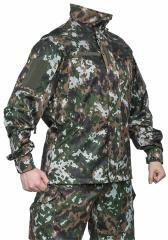 L4 clothing offers protection against the outside world through camouflage and abrasion resistance. 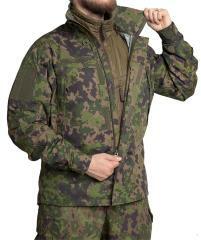 These garments are designed for minimal thermal load for effective layering. 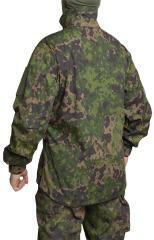 Camouflage prints and visible accessories are 100% NIR compliant. The measurements in brackets are the recommended user chest circumference and height. These are very slightly oversized to accommodate warm mid layer clothing. 50% cotton, 50% polyamide ripstop, weight 210 g/m2. Lightweight, strong, quick drying and breathable. 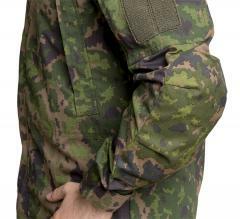 Compared to Cooltex 3 (the fabric commonly used by the Finnish military) this fabric is roughly 30% lighter, which roughly means it retains 30% less moisture thus making it dry up much faster. The only downside is the higher cost, but the functionality is worth it. The elbows are reinforced with 500D Foxdura (100% polyamide), relatively lightweight but very wear resistant. 70% polyester, 30% cotton, weight 210 g/m2. This is the same fabric that is used in Finnish military M05 cold weather parkas and trousers. 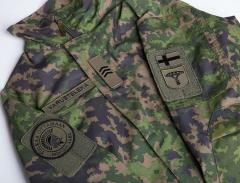 The M05 winter camo variant has reinforcements made from the same fabric as the rest of the garment. Unfortunately no M05 winter camo pattern Foxdura/Cordura is yet available. 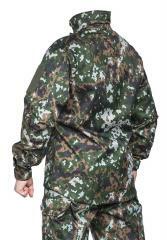 If you wish to ensure that the NIR compliant properties of the camouflage print are not diminished we recommend being very careful when using common detergents. All-natural stuff without any optic brighteners should be safe. Alustava arvio: näin uudesta tuotteesta ei voi sanoa miten se kestää pidempää käyttöä. Aivan. Pirun. Hyvä. Takki. Vaikea edes keksiä mitään valittamista. Mukavuus painavan repun kanssa on jotain vähän maagista, kun missään ei ole saumaa tai taskua joka hankaisi paskamaisesti. Näkee että takki on suunniteltu oikeasti ajatuksella. Vaikka kangas on ohutta ja hengittävää, tämä on oikeasti yllättävän lämmin takki, luultavasti koska vetoketjun tuulensuojalista on tehty sen verran fanaattisesti, että läpi ei kyllä tuule. Jos liikkuu sen verran rivakasti että meinaa lämpö nousta, molempiin suuntiin aukeava vetoketju ja kainalovetoketjut hoitavat homman kuntoon. Kokosysteemi on pirun hyvä, ja sekä helma että ranteet saa kiristettyä niin tiukalle että luulisi sirommankin sällinkin olevan tyytyväinen. Jos pitää väkisin keksiä jotain mussutettavaa... se että takki on sisäpuolelta "vaalea" voi mahdollisesti olla ongelma sotaisammille käyttäjille silloin kun takkia tulee tarve avata lämpökuorman pienentämiseksi, mutta enpä tiedä. -Henkilökohtaisesti en tykkää noista vetoketjullisista hihataskuista. Tarrakiinnikeiset taskut olisi omasta mielestä paremmat ja toimivammat. Olin skeptinen mutta ostin koska M05-jakotavaratakki on niin ankea kosteusimuri, josta minun oli lopulta aika erota. L4-housut oli jo vuoden käytössä näyttäneet ylivoimaisuutensa, mutta tätä epäilin vielä, varsinkin taskujen toimivuutta. Mutta mitä vielä. Kangas ihanan kevyttä, tiivistä ja hyvin kuivuvaa. Miellyttävä päällä. Reissussa havaittu että kainalossa tuuletus on toimiva ja ylipäänsä takin leikkaus hyvä. Tämä jopa särmäytyy vyötärölle. Mutta... Vetskarit eivät aina oikein skulaa, erityisesti liivin alta kaivaessa on isojen taskujen sulkeminen niin ja näin. Samoin kauluksen vetoketju on yllättävänkin hankala vetää ylös. Tuntuu jumittavan. Hihataskut sen sijaan erittäin hyvät ja hyvä vetoisuus. Povitasku olisi ollut kiva, just because. Ja niin ne isot taskut? Niihin mahtuu vaikka mitä ja nyt kun ei ole alataskuja enää on vähemmän vaihtoehtoja mihin hukata kamat kesken harjoituksen. Mutta näihinkin saa hukkumaan eli tilavuutta riittää oikein hyvin. Pisteet siitä. Velcro näissä on jotain outoa versiota, nimittäin arvomerkit sun muut lähtee rinkkaa riisuessa helposti samalla matkaan. Kaiken kaikkiaan hiton hyvä parannus vs PVM05, paremman näköinenkin, ja ennen kaikkea todella paljon toimivampi. Pientä fiksattavaa on vielä, mutta oikeasti tämä on perusteltu ostos jokaiselle joka viettää vähänkään enemmän aikaa kentällä. Erittäin hyvä paidan korvike. Ei siis täyttä retkitakkia korvaa, mutta kun tarvitsin pyörällä ajeluun pusakkaa, niin sopii kuin nappi otsaan. Kaulus on erinomainen, suojaa muttei hierrä. Ainoa pieni miinus, on se seikka, että napinlävet ovat 1 mm liian pienet, mutta kyllä ne siitä venyvät, kunhan ei vaan napit katkea. L3 välitakin ja Svala verkkoaluspaidan kanssa on kyllä parhautta, ei hiosta, mutta lämmintä on. Ensikesänä käytän tätä varmaankin metsässä teknisen kauluspaidan tilalla, eli paremmat taskut kuin useimmissa retkipaidoissa, pikkasen tukevampi kangas, mutta muuten melko sama tuote. Ja tuosta metsävärisestä on puhe. Taskut ovat sitten yllättävän pienet, mutta takin tarkoitus huomioiden se kuulunee asiaan. 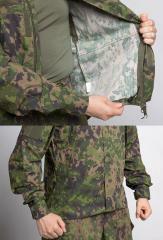 Super main jacket for long-distance hiking. NOTE: This review is based on the Winter camouflage version. 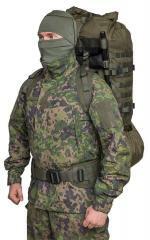 I will likely update it when I get a chance to snag the Forest camouflage version. I have owned a lot of military style jackets over the years, be it hand-me-downs from my father who served in the Canadian Armed Forces, or from Canex. I am fond of them because they are durable, they last a long time, and they usually are very practical garments, with good carrying capacity arranged in a sensible way. But among all those jackets, this one stands head and shoulders above pretty much everything I've ever worn. It fits pretty much perfectly, the pockets are large, sewn quite sturdily, and are easily accessible. 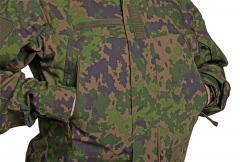 I can fit some Scho-ka-kola, a hip flask, and a couple folded up Bundeswehr triangle scarves. The shoulder pockets are great for field notebooks. The material is a great windbreaker in the winds we get here in the valley as well. It's also one of only a couple of jackets I've worn that feels natural when I've wearing it. Rather than feeling bulky or clumsy, it feels almost like a second skin. Even the CAF windbreakers, probably my (now-second) favourite military garment, suffer somewhat from being a bit clingy and thus clumsy, when wet. This jacket has survived hiking, the machine shop, and pretty much everything else I've thrown at it; blizzards, mud, freezing rain. You name it. Canada loves its varied, fun weather. My only complaint is quite petty: the shoulder receivers for patches being stepped right up against each other means the CAF issue Canadian Flag patch is too large to fit entirely, resulting in a patch with curled edges. 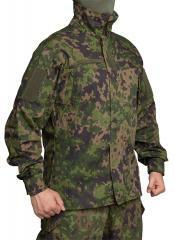 But given this is a Finnish jacket, I cannot expect it to take into consideration Canadian gear. Nonetheless I mention it, as it is the one thing standing between this jacket and perfection, as far as I am concerned. In the end, this has quickly become my favourite jacket, and I'm going to need to get myself more of them.